Join our glass fusing classes and learn how to create your own glass tiles, window hangings, plates, jewellry, and wall art! 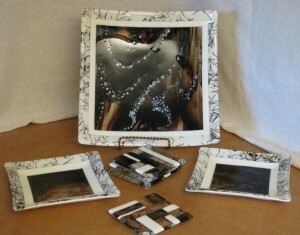 We teach the Conestoga College Glass Fusing classes. Beginner courses run 6 weeks long, three hours per week in the evenings 7 PM until 10 PM. These classes are taught at our studio at 88 Woolwich St. S in Breslau. The next session of 6 classes begins Tuesday January 15th, 2019 from 7 – 10 PM and continues until February 19th,2019. Registration fee with Conestoga College is $228.06. Allow an additional $75.00-150.00 for your tools and System 96 glass for your projects. This course # GINT0903, is under General Interest in the Conestoga College Catalogue which is now online. You can register online at www.conestogac.on.ca. click on Continuing Education, then Course Offerings ,enter course #GINT 0903. You can also register via fax or mail using the registration form from online or in the paper catalogue. Contact us for more information about upcoming classes or if you would like to know about private group lessons, birthday parties, or glass kiln rental.